Buy this item and earn 3,695 ClubPoints. CrystalView DVI CATx is the KVM extender of choice for businesses that need to extend and operate a computer, server, or KVM switch from a great distance. CrystalView DVI CATx makes this possible by the use of standard CAT5, 5e, 6, or 7 cable. 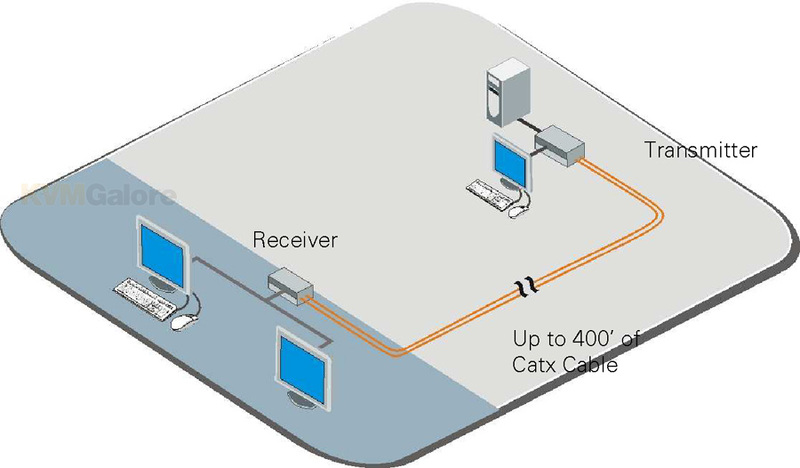 You can fully operate and control a computer or server from as far away as 400 feet using standard CATx cable. 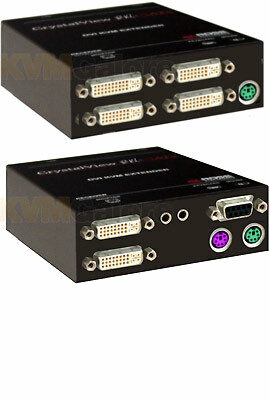 It supports all combinations of DVI-D monitors and video cards. The system consists of two units: a transmitter and a receiver. The transmitter connects to your CPU's keyboard, DVI-D monitor, and mouse connectors, or to a Rose KVM switch. The receiver connects to a keyboard, DVI-D video monitor and mouse or KVM station. The transmitter and receiver are connected together with CATx industry standard cable. The receiver can be up to 400 feet from the transmitter using CAT5, 5e, 6, or 7 cables. The transmitter's local KVM access allows an additional KVM station to be connected to the transmitter unit, providing operation from the transmitter or the receiver unit. Serial/audio model connects to the computer's serial and audio ports and to the corresponding ports on the transmitter. The serial/audio receiver connects to a set of speakers and to a supported serial device. Installing the CrystalView DVI CATx units is as easy as connecting the KVM station to the receiver, connecting the CPU to the transmitter, and connecting the transmitter to the receiver with CATx cable. The remote unit connects to a set of speakers and a supported serial device. CrystalView DVI CATx uses a microprocessor to emulate the keyboard and mouse. Only the transmitter unit has to be connected for the PC to boot properly.